The Dougherty Valley High School (DVHS) in San Ramon hosted this tournament. 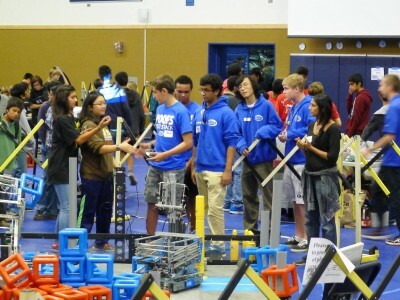 The team was pleased to see upon arriving that competition boards were placed in the pit area, and that the location of the pit allowed for very quick switching between matches. Unfortunately none of our sub teams managed to qualify for States, but this competition allowed our robots to be tested for the first time and we used this feedback to repair and upgrade our bots. 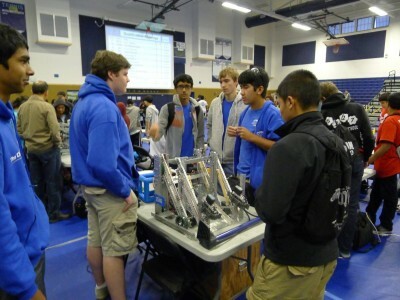 For example Team 254F lost two matches in qualifications and two in eliminations. The members of Team 254F are now working on improving their intake and looking forward to the next VEX tournament. Thankfully there were no MAJOR technical issues (robots catching fire, exploding, becoming sentient) and all of our teams learned a lot in the competitive process. The tournament was a success! 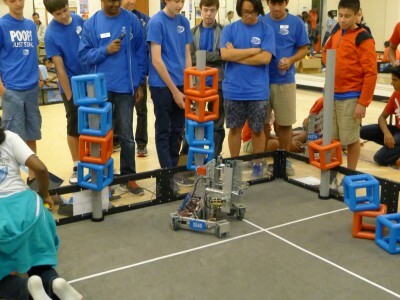 We would like to recognize teams 21D for their excellent design for the high rises, and also 6089, 5776C, 5327A, and many other teams in attendance for challenging us and helping our sub teams to improve their bots. Lastly, many thanks to DVHS for their tasty and very reasonably priced snacks; oh and also for hosting this fun and competitive tournament. And to the VEX teams at the competition, all of us are looking forward to seeing many of you at the Bellarmine VEX tournament this November!